Unai Emery breathed a huge sigh of relief while Manuel Pellegrini could barely believe his bad luck. After three matches Arsenal�s post-Ars�ne Wenger era is finally up and running thanks to a comical own goal from Issa Diop 20 minutes from time after West Ham � inspired by the excellent Felipe Anderson � missed a series of chances that left their new manager shaking his head at the final whistle. Arsenal were missing Mesut �zil through illness yet again and this comeback after Marko Arnautovic had given the visitors the lead was the perfect fillip for Emery following a difficult first few weeks in charge. However, given how they struggled at times to contain their opponents on the break even after Nacho Monreal�s equaliser, this Arsenal side remain very much a work in progress. �zil�s absence allowed Aaron Ramsey to return after being left out for the defeat against Chelsea last Saturday, amid continuing doubts whether the Wales midfielder will sign a new contract at the Emirates. That cloud hung over Jack Wilshere for the majority of his final season in north London and his decision to join West Ham was based on the belief he would be a regular starter. Three successive appearances would seem to have borne that out and so far he has worked tirelessly � albeit in a third successive lost cause. Wilshere was one of seven summer arrivals in a team that featured four changes for the second successive week after opening defeats by Liverpool and Bournemouth. The addition of Carlos S�nchez � who took only 150 seconds to register his first foul � alongside Wilshere added much-needed steel in the middle, although Wilshere was given a rude awakening in an early clash with Arsenal�s latest teenage midfielder, Matt�o Guendouzi. A flowing move in the 11th minute almost ended with the hosts taking the lead but Ramsey�s header was correctly ruled offside after Lukasz Fabianski saved brilliantly from Henrikh Mkhitaryan�s drive following good work from H�ctor Beller�n. But with Anderson thriving in his free role West Ham looked dangerous on the break and almost went ahead straight afterwards, only for Arnautovic to hit the side netting from Robert Snodgrass�s pass. The Austrian made no mistake with his second attempt 13 minutes later after being set up by Anderson, drilling the ball home from the edge of the penalty area with a first-time shot. Arsenal responded well and were level within five minutes. The influential Mkhitaryan played in Beller�n and his cross was palmed by Fabianksi straight into the path of Monreal, who tapped home. Yet if a failing of Arsenal under Wenger was their defensive naivety, then the last 15 minutes of the first half showed Emery still has plenty to do. Michail Antonio fluffed his lines following an excellent through-ball from Anderson while Snodgrass was denied by Petr Cech on the stroke of half-time when it seemed easier to score. The introduction of Alexandre Lacazette for Alex Iwobi after the break at least showed Emery knew things had to change, and efforts from Shkodran Mustafi and the substitute inside the first 10 minutes forced saves from Fabianksi. West Ham still threatened, though. Arnautovic, who limped off moments later, passed up a golden opportunity to score his second after another superb ball from Anderson but failed to muster the requisite power behind his shot. 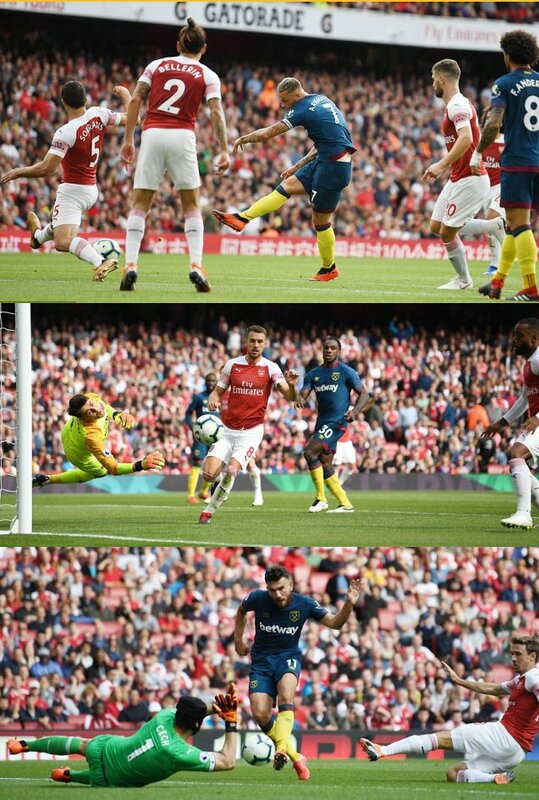 Pellegrini then threw on Javier Hern�ndez and, in Lucas P�rez, another Arsenal old boy and it came close to paying off immediately when the Mexican curled an effort just wide after being afforded acres of space by the Arsenal defence. Cech almost handed West Ham the lead when he spilled Anderson�s shot from the edge of the area and looked relieved to see the ball fall to an Arsenal player to clear. It was another defensive error that was to prove decisive. Diop � a France international signed for a club-record �22m from Toulouse in the summer � inexplicably booted the ball high and not very far, and ended up turning the ball past his own goalkeeper after good work from Lacazette. Another replacement, Danny Welbeck, rounded things off in injury time with a simple finish after more good work from Beller�n to give the scoreline an extra sheen. It was not pretty. But then one has to start somewhere. Subs not used: Elneny, Lichtsteiner, Holding, Leno. Subs not used: Zabaleta, Adrian, Rice, Obiang.